“Sahaja Yoga Meditation is concrete, verifiable and tangible like science itself and completely understandable in rational terms”. Many researches and studies have proven the positive effects of Sahaja Yoga Meditation on the holistic health of practitioners. A PhD study conducted by an eminent doctor who formerly headed the Lady Hardinge Medical College in India has shown that Sahaja Yoga Medition has resulted in health improvements on chronic diseases such as asthma, hypertension and even epilepsy. Doctors in Australia have also proven positive effect of Sahaja Yoga Meditation on men suffering from Asthma, kids suffering with ADHD and women experiencing menopausal hot flushes. A study of Sahaja yoga meditators using a Quantitative Electro Encephalo Gram (EEG), demonstrated widespread changes in brainwaves, with prominent theta wave activity at the precise moment that the meditators reported a state of complete silence and “oneness”. Even when we are not suffering from any chronic disease, we do face stress which has an adverse effect on our holistic body. Easily measured and relatively reliable, Galvanic Skin Resistance (GSR) has been used as an index for those who need some measurable parameter of a person’s internal “state”. 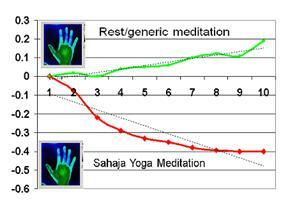 Experiment done to measure the Galvanic Skin Resistance had shown considerable improvements in Sahaja Yoga as compared to other generic meditation. There was significant decrease in the skin resistance hence reflecting the improvement in the “internal state“ of the object in relation to the stress and emotional balance. 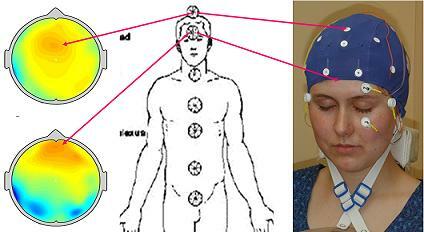 Interesting Experiment done in Italy based on the Electro-Accupuncture on the Voll machines reveals the extraordinary effects of Sahaja Yoga Meditation on internal state of energy level. It shows, a few minutes of daily meditation is all you need to have optimum level of energy with in you.